Which begs the question: Will magnets stick to Adamantuim? Which begs the question: Will magnets stick to Adamantuim? 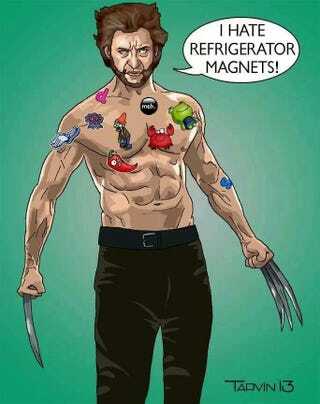 I can't find anything in the wiki about it, so I put it to the X-scientists out there, can refrigerator magnets stick to Wolvie Stabbers? And for the doctors in the house, what part of his body, assuming his skeleton does attract magnets, would be the most stickable? Post fun fridge magnets along with any answers please!! EDIT: Magneto seems to be the crux here, but I pose another question: Can Magneto manipulate aluminum or is it just metal with magnetic properties?